Location of links to “Sign in” to Kolibri. 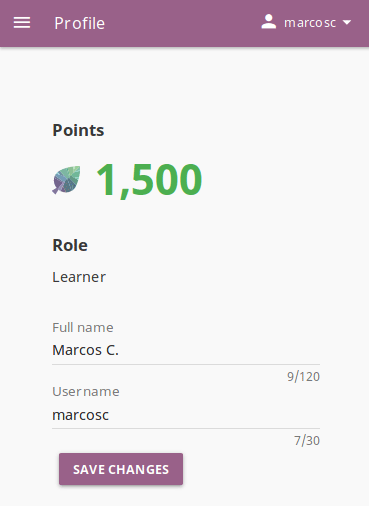 Once you have logged in into Kolibri, you can see and edit your user data from the Profile option in the main sidebar menu (below Learn). View and edit your user profile. 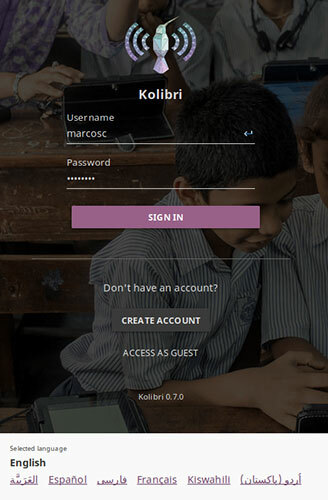 Each time you login into Kolibri, the first thing you will see is the Learn page. 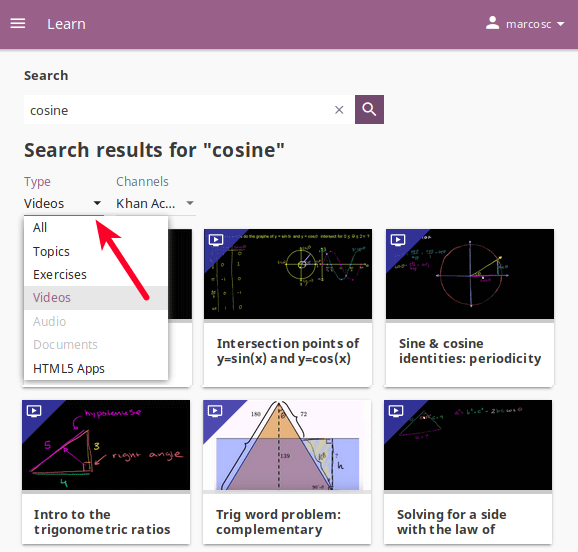 Here you will find learning topics and materials related to what you were doing the last time you used Kolibri, or those recommended by your teachers and coaches (not visible if you are browsing as a guest). 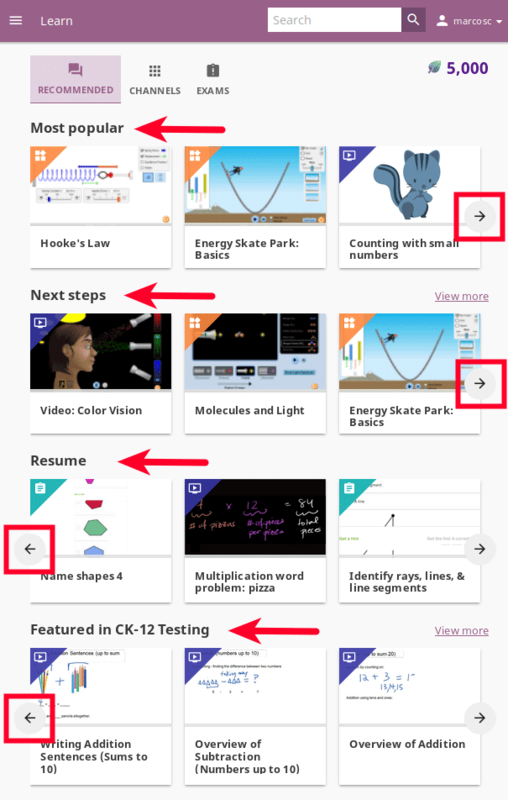 Next steps displays suggestions according to topics and materials you previously visited. 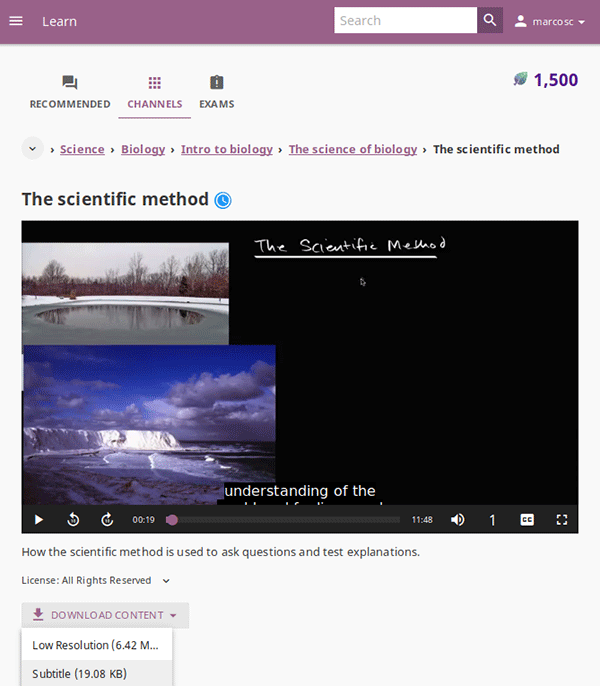 Featured in… displays a preview of activities for each content channel you have access on Kolibri. The number of displayed content items in each row will depend on the width of your display, but you can browse through with the See previous and See next icons at the beginning and the end of the section rows. Learn page gives you access to all Kolibri learning content and activities. 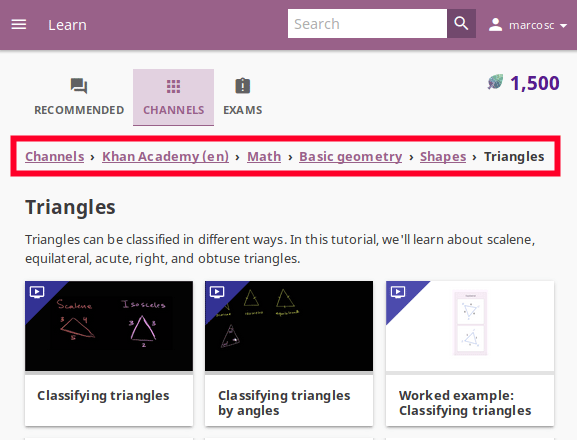 Topics tab offers you the option to navigate through the complete set of learning topics and materials available in Kolibri. Use it as you wish, or according to indications from your teachers and coaches. 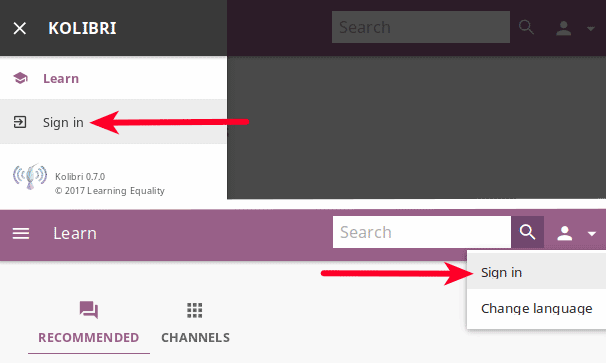 Content in Kolibri is grouped in channels. Use breadcrumbs links to navigate back through Kolibri topics. Click the magnifying glass icon in the upper right corner. Type the word or combination of words you are looking for in the search field. Press Enter to display search results below the field. Search page gives you option to search for a specific term in Kolibri. When you are ready to submit, click the Check answer button. 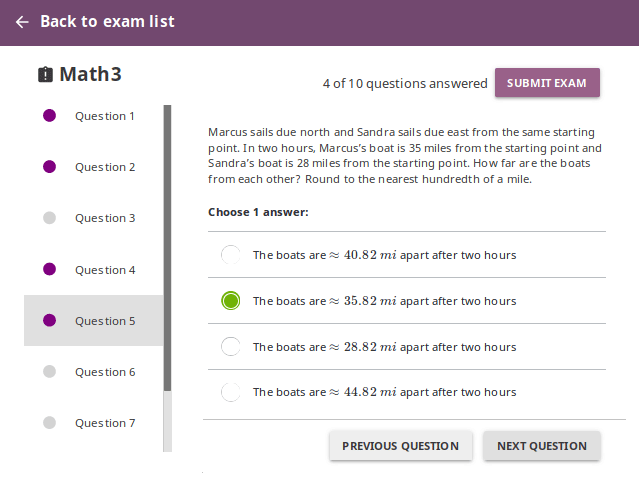 If the answer is correct and a check mark appears, click the Next question button to proceed. If the answer is incorrect, click the Get a hint button, read the suggestions, and try to answer again. 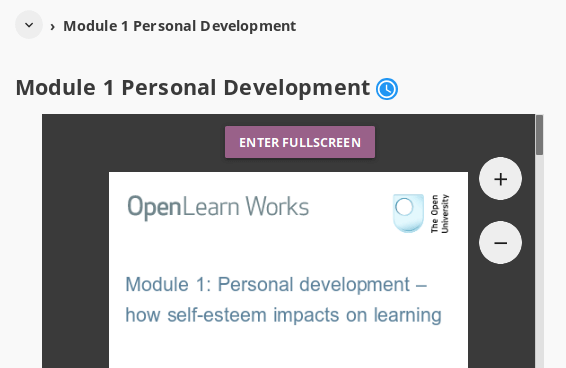 The progress bar below the exercise is taking into account only the most recent answers you give, and that means that you need to have the required number of correct answers (check marks) in the row for the exercise to be considered completed. 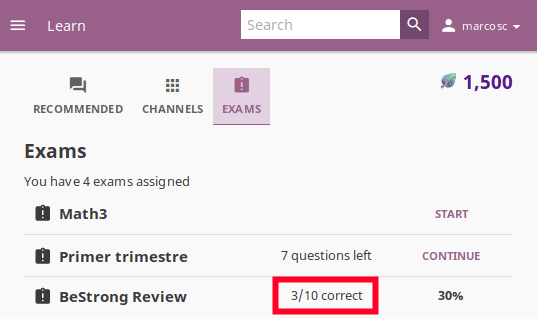 Once you have achieved the required number of correct answers in a row, click the Next item button, to continue learning with the rest of the material in that topic. 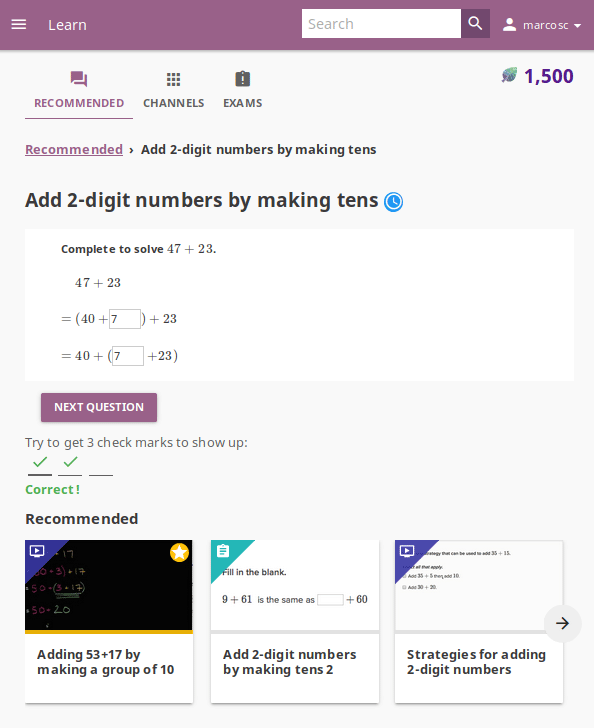 If you are unable to solve some questions, try reviewing the videos in the Recommended section below the exercise, or seek help from your peers or teacher/coach. Use the Enter fullscreen button to open the PDF file in fullscreen view. 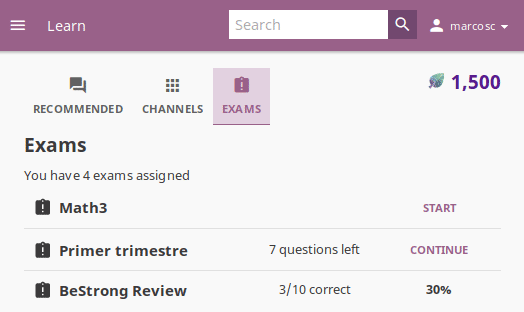 If your teacher/coach scheduled an exam for you or your class, it will be available through the Exams tab. You may have more than one exam available at the time. Press the button Start for the exam you are ready to start taking. Press the Back to exam list if you want to pause the exam and come back later. Press the button Continue to resume when you are ready. Press the button Submit exam when you are positive that you answered all the questions, and you want to submit it for grading. You will see instant feedback with the result of your exam.